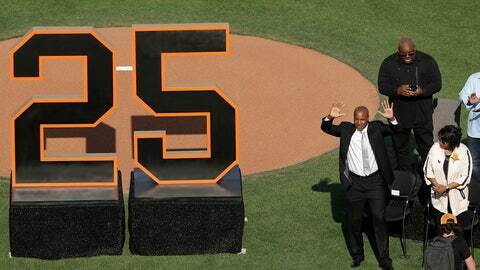 SAN FRANCISCO (AP) — Likely for the last time and almost 11 years after playing his final game, Barry Bonds ran out to his old spot in his No. 25 Giants jersey. The seven-time NL MVP was greeted with a rousing ovation as fans chanted his name. The 54-year-old Bonds waved, clapped his hands and raised both arms to acknowledge the cheers as he made his big entrance from center field.